Here is something I thought it might be fun to do from time to time. Look back at a classic photo and share a little info about who is in it and the events surrounding it. I already do a bit of this over at PulpMX.com, but I though I could do it here and make it more of a quick shot and not as involved as what I do for MX Captured on Pulp. For this first installment, we are going to look back at this cool shot from the start of the Gatorback National in 1992. 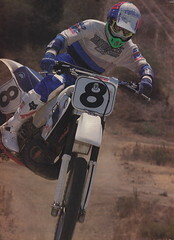 This picture is by Kinney Jones and it appeared in the Gallery section of the first issue of Inside Motocross magazine. In it, you can see Factory Honda’s Jeff Stanton (2) pulling a holeshot ahead of Kip Sandell (44), Larry Brooks (30), Ross Pederson (80), Damon Bradshaw (4), Mike Craig (59), Todd Dehoop (25), Doug Dubach (25), Mike Kiedrowski (3) and Phil Lawrence (65). At this point in the series, Honda was starting to get the all-new CR250R sorted out and were finally able to challenge Damon Bradshaw at the front. of the pack. At Gatorback, Damon was able to keep his winning ways going by taking the first moto win, but troubles would plague Supercross points leader in the second leading to a 16th place finish. Taking advantage of Bradshaw’s struggles would be Stanton, who would race to a second moto win and capture the overall with a 2-1 for the day.